The Crown Point marriage mill cut another notch in the hall of public fame on Wednesday afternoon when Rudolph Valentino and Miss Winifred De Wolfe, with a party of friends from New York and Chicago journeyed to the famous “Gretna Green” and were married by Justice of the Peace Howard Kemp. After securing the necessary license at the county clerk’s office, in which Valentino gave his name as Rudolph Gugliemi, aged 28, and his bride as Winifred De Wolfe, aged 26. the couple went immediately to the office of Judge Kemp and the ring ceremony was performed which made them man and wife. Several witnesses were present at the marriage ceremony and those signing their marriage certificate were Attorney Michael Romona, of Chicago, Mr. and Mrs. Arthur Butler Graham, of New York, and Mrs. Welner, of Salt Lake City, Utah. Judge Theodore Klotz, of Hammond, a friend of the party accompanied them to Crown Point. When it became noised about that the famous screen artists were in the city, a crowd quickly gathered curious to see Valentino and his bride and they were given an impromptu ovation and showered with congratulations as the party started Chicago-ward after the ceremony. Following the marriage, the news was flashed to the press of the world and once again Crown Point gets into the limelight as being the scene of the marriage of famous folk. Valentino, while going through the ceremony appeared as nervous as any country swain that ever took the important step and there was nothing about his appearance during the ceremony that bore out world-wide reputation of being the cool, calm deliberate and “perfect lover” of screen fame. No small part of the success of the photoplay production is due to the resourcefulness and inventive genius of the camera man. This fact demonstrated itself during the filming of “The Four Horsemen” when John Seitz, chief cameraman of the Rex Ingram Unit resorted to unusual and entirely original means to obtain desired screen illusions. Many specially perfected photographic devices were utilized and again Mr. Seitz has brought them into exclusive use for Metro’s latest Ingram directed special “The Conquering Power”. In addition, a new method of registering vison scenes where ghostly or transparent figures are required, was perfected and which revolutionizes the filming of those episodes to a point of effectiveness never before attained. The cruder, methods of double exposure, often more or less bungling until retaken again and again have been eliminated. One scene in “The Conquering Power” where imprisoned miserly Grandet is visited by spirit forms of those whom he wrong, borders on the uncanny and intensified a hundredfold by this new camera device. It is innovations of this kind that help to make big pictures and “The Conquering Power” is in every sense of the term ‘a big picture’. Reviewers are wont to say that Rex Ingram has given to the motion picture world a real rival to “The Four Horsemen” from the standpoint of impressive character portrayals. Artistic treatment and scenic investiture. Walter Huntley was born 04 Mar 1879, in Milford, New Hampshire. Walter Long’s experience on the theater stage helped him transition to the motion picture field, where he was type-casted as a character actor. Walter’s talent was for “hard-guy” movie parts in over 200 movies and television to his credit. Walter Long was 5’11 inches tall, 175 lbs, brown hair, with gray eyes. Despite his mean looking persona, he was considered a very nice guy. He married to Luray Huntley, actress worked for D.W. Griffith until her death in 1918 from influenza. Walter served state-side during World War I and II and was honorably discharged. He worked in 4 films with Rudolph Valentino “The Sheik” “Son of the Sheik” ”Blood and Sand” and “Moran of the Lady Letty”. Walter died on 4 Jul 1952, at the LA Coliseum. He is buried at Hollywood Forever Cemetery, Garden of Memory, Lot 527. 4 Mar 1930 – Rudy and Jean Acker Wed on Wild Impulse At a Giddy Party and Separate at the End of the Dance. The legendary Rudy who fed on mash notes, the lounge lizard, the sheik, with only a gross sensory appeal was no more the real Valentino than black is white says Natacha Rambova. He was a great artist, she says, be he wasn’t given the credit for the real art he had. His unusual abilities were neglected to emphasize the grosser side. This forced him into a role he hated to play. He was not a great actor in the sense of Bernhardt or Booth were. Bernhardt studied a role until her brain dictated the emotions. Rudy absorbed his role emotionally and played it intuitively. Natacha Rambova met Rudy in a movie office in Hollywood she recalls. Rudy and I wanted to be married, but we couldn’t because of Jean Acker and she was making it difficult as possible for him to get his divorce. It was during the film of “The Sheik” that divorce proceedings were started and reached their peak of difficulties; so it was a trying time for us both. This early marriage took place shortly after Rudy came to Hollywood just as a lark at a party. From the first, it was a mistake but all Hollywood, of course was crazy mad. People act on impulse and have regrets later. Rudy and Jean Acker scarcely knew each other. They had met one evening at Pauline Fredericks planned a horseback ride together and during that ride became engaged. A few hours later Rudy sauntered into the Hollywood Hotel, where he chanced to meet May Allison and Mr. and Mrs. Maxwell Garger. In the exuberance of a man in love he confessed to them he was going to be married. Mr. and Mrs. Garger were planning a party next evening as a farewell to Richard Rowland, President of Metro. As a sort of fillip to the event, they suggested he get a marriage license immediately and turn their party into a wedding. Rudy, impractical and careless agreed. After the ceremony and supper, they danced until 2:00 a.m. when the bride unceremoniously left him. Jean at that time, was working with Fatty Arbuckle in “The Round Up” and when the disillusioned bride groom sought her out on location the next morning he found she had skipped to Los Angeles. He followed her there only to be told she could never return to him. Rudy left at one for New York to make tests for “The Four Horsemen” and Jean asked for an annulment. They didn’t see each other again for four months. The success from this movie turned Rudy from a penniless nobody to a genuine movie star and Miss Acker changed her demands from annulment to divorce with alimony. Rudy fought this and asked for a divorce in the meantime. He continued to pay dearly for this mistake of his youth even after the divorce was granted. Jean Acker continued to use this to her financial advantage. For example, she went on a vaudeville tour using the last name of Valentino. She started insisting people call her Mrs. Valentino. She was never a real wife but she certainly did what she could to look like she was the one that was wrong when in reality the injured party was Rudy. WHAM! A fist shot out and Rudolph Valentino, sheik of the movies, threw up a protecting army and ducked his head. This occurred in the lobby of the Mogador Theatre in Paris, the other day, when The great picture favorite graced the first showing of his own new feature picture with his presence. Those of the audience who had observed Mr. Valentino in the flesh, Sitting quietly in one of the boxes, looked at him with reverent awe. Just as the film was coming to an end he excused himself from his party saying that he would step across the theatre And kiss the hand of the Countess d’Uzes, who was waving at him. He passed up the side aisle and started through the lobby, those by met making way for him as though for royalty. One Man however, did not act that way at all. There were tears in this man’s eyes, a handkerchief in his hand and his nose was red. Mr. Valentino noticed this person, not only because his clothes And manner showed him to be a man of some consequence, but it because it is a triumph for a picture to make a man cry. When the weeper turned his moist eyes on Valentino he jumped as though he seen a ghost. Then he shot out a sentence, in German so hysterically that the actor did not understand it. But when the man’s fist swung viciously at Rudolph’s nose, he understood that gesture, ducked and, with his right, gave the stranger something to cry about. The man went to the floor and arose, but before he could resume the battle, friends of both parties rushed between, cards were exchanged and Mr. Valentino found that he was dated up for a sword duel to be fought at the wretched hour of sunrise. “Who is this fellow and what does he want to fight with me about?” asked Rudolph, with pardonable curiosity. “It is the Baron Imre Lukatz and he says you have been hugging and kissing and stealing his fiancée and all that while he was away” replied Frederico Beltran Masses, a well-known Spanish painter, who had taken charge of Valentino’s interests in this fracas. “But I never saw him before., nor his finance. There is some mistake.” “Possibly”, agreed Masses, “but he demands satisfaction on the field of honor and you see everyone is looking at you, and the Barons face shows that someone has wronged him. I am afraid that you will have to go through with it”. Before the war, Baron Lukatz, who now thirsted for Valentino’s blood was a wealthy Austrian nobleman engaged to marry the very youthful Vilma Banky, daughter of one of the richest families of Budapest and already celebrated as a young beauty. The Baron was a happy and much envied man and then, just as they were about to name the wedding day, the great war came along and postposed everything. The wedding was put off until the triumph of the Central Powers, which was estimated as a matter of 3 to 6 months. When the agony went on, from year to year, the Baron was able to get home from the front just often enough to keep the fires of unsatisfied love aflame. At last the final crash came, and the love-sick nobleman had only one consolation, he was now free to return to marry his beloved. Vilma was apparently as much in love as ever, but suddenly a disagreeable question intruded itself between them like a horrid chaperone. What were they going to marry on? The fortunes of the Baron and the Banky family were invested in securities payable in German marks. They were still technically millionaires, but in reality the mark had been made so worthless that their wealth was about equivalent to a trunk full of cigar coupons. Again the happy day was postponed, while the Baron cast an aristocratic eye around for a job. For every position from head-waiter up, he found several needy Grand Dukes ahead of him. The future looked dark for the love smitten Baron. Just then a ray of light, light for Vilma but not necessarily for the man who had waited so long to marry her. An American moving-picture director saw sufficient promise in Vilma’s beauty and culture to invite her to sign an 2 picture contract and pay her expenses in Hollywood. The girl jumped at the chance and it was all settled when the jobless fiancée returned from a fruitless trip to Paris. The Baron was dismayed at the prospect of parting from the girl he loved for there was nothing in the contract about his expenses. However, he could not stand in the way of a likelihood of such big money, so with a heavy heart, he agreed. But fate had put him off so often that this time he protested. He thought it was only that before rushing to America she should marry him. Miss Banky was inclined to agree, but the hard-boiled director did not want any strings tied to his new piece of property and talked her out of it. He said: “For an artistic career, a husband is a millstone. Wait until you are an established star and then maybe you will be strong enough to swim with one around your neck. And besides you may fall in love with some of the American millionaires that are always hanging around the studios and then what? Vilma thought this was perfectly silly advice, but she took it just the same, the amorous Baron found himself procrastinated with the promise that she would hurry her two pictures through and then come right back and marry him. When Vilma sailed the Baron felt as lonesome as a lost dog, but distracted his mind by writing a daily letter to his girl, always cautioning her to beware of wicked but fascinating actors. After a while Vilma’s letters grew very vague and infrequent. The Baron became anxious. What did this mean? What was going on? What had happened to his innocent Vilma in wicked America. He had about made up his mind to scrape together funds enough to rush across and rescue her, if it was not too late, when a letter came saying that her first film would soon be released in Europe and shown in Paris. One glance at her face on the screen would surely tell him if drugs, drink, and worse had touched her. Baron Lukatz was the first man in when the doors of thetheatre opened, the long wait and the orchestra strained his nerves to the last notch of suspense. What was he going to see? At last he beheld a close-up of one of the prettiest faces on the screen and, to him, the dearest in the world. “She’s all right. There’s nothing the matter with her!” he cried out in joy and relief at seeing the beautiful expression he knew and loved so well. “Yes, quite all right said an Englishman who sat beside him and looked the Baron over coldly through a monocle, “but why have a fit about it”? The Baron apologized for speaking out and explained Vilma was his fiancée. The Englishman gave him a new and more careful scrutiny. “Extraordinary” he remarked, “most extraordinary” and aimed his monocle back at the screen. The Baron did not care what the Englishman thought, he was happy and a great care was off his mind, but not for long. The other actors seemed clear eyed and decent except those that he knew were made up to look vile. She seemed to be in pretty good company. He got a momentary thrill of indignation when the villains desecrating hands were laid upon his wife to be and broke the strap of her gown. This made the fight for her good name against this husky villain still more unequal, because she now had to hold up her bodice with one hand and fight him off with the other. Still he knew, like everyone else in the movie house, that the forces of law and order and censorship would save the girl somehow and they did. The male star arrived somewhat overdue, but with a good excuse and gave the villain the beating which he had been earning all through the picture. It was a good job, and when the miscreant had been pounded to a pulp the Baron felt a sense of personal gratitude. He imagined Vilma thanking the young man and saying she wanted him to meet her future husband, the Baron Imre Lukatz, who would also wish to thank him. What the Baron beheld was nothing like that at all. Vilma simply put her white arms around her rescuer’s neck, placed her lips against his and kept them there for what seemed to one man an eternity and she forgot all about that important strap, sole support of her bodice. That was not acting that love stuff in that kiss. That man must of really made love to his Vilma and taken advantage of his absence. Would they never fade out of that infernal kiss. Decent people did not kiss that long. This was terrible. To be six thousand miles away from the woman that you love and know that someone was successfully making love to her to see the proof of it every night on the screen for he could not keep away and he grew to hate that actor as he had never hated before. While collecting funds to start for America and give that hero what the hero had given the villain there came an answer to his outraged complaint. Vilma was hurt and astonished that he could be jealous of an actor, paid to pretend to make love. She wrote to the Baron that she was finishing her second picture and that objectionable actor was now working in Long Island City 3,000 miles away. The Baron received a worse shock. It was perfectly clear to his eyes that with this new man she was worse in love than before. He itched to get his hands on one of these fellows. In response to his cable came the answer that Vilma decided to stay and make one more picture. That was too much. If only fate would let him get his hands on one of them, just one. 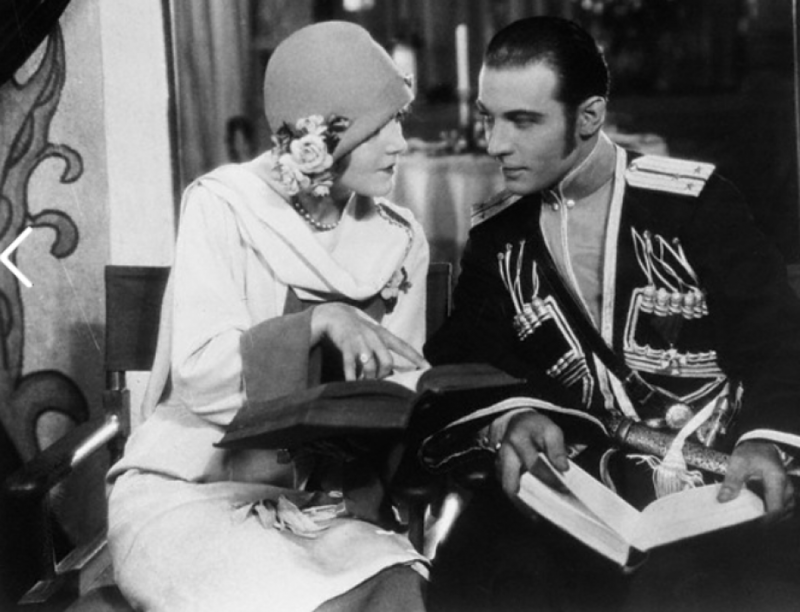 At the Mogador Theatre in Paris, the other day, the Baron came as usual to suffer at the opening of the newest film, in which he knew his beloved Vilma Banky would play opposite Rudolph Valentino, and he shuddered in expectation of that dreaded love scene he knew would come at the end. It proved to be the worst yet. If heaven would only let him get at the Sheik Valentino he would ask for nothing else. No sooner was that prayer uttered than it was granted. Right there in front of him moving through the lobby loomed the feature he had just been cursing at one the screen. There in the flesh was Rudolph Valentino. Leaping to his feet the distracted lover sprang in front of Valentino and shot his fist at the astonished stars nose, as already described, and the arrangements were made for the “duel” were quickly made. One of the cruelest things about duels and executions is that they are done at daybreak when people ought to be in bed. After a long cold taxi ride in the dark, Rudolph Valentino arrived with his seconds, Frederico Beltron-Masses and Horatio St. Just, a young Italian who was engaged to Miss Millicent Rodgers until the Austrian Count Salm came along and spoiled everything by marrying her. He was willing to get up that early on the chance of seeing an Austrian nobleman get hurt. Dawn was just breaking and Valentino was dressed in silk trousers, white silk shirt and low pumps like a dueler of old walked through the wet grass to the soggy and mist covered field of honor outside of Paris. He brought with him a pair of 18th Century dueling swords. After he had gotten pretty thoroughly chilled Rudolph heard the footsteps and sobbing. That must be the Baron, for he remembered that there had been tears in his eyes the night before, and that his nose was red as if from much weeping. That was the one reason why he had not tried to reason with the man. No use trying to talk with one who is so upset that they are crying. The Baron, followed by his two seconds, marched up to the actor dabbing at his eyes with a handkerchief and sobbed “I am sorry Mr. Valentino. Last night, I was so upset. I could not believe that you were merely doing for pay what I would pay anything to be allowed to do. But I hear that you, have been unhappy in love and I ask that you forgive me for losing my temper. The movie sheik held out his hand for, after all, he did not know what it was really all about except that he had been told to get up in the middle of the night and fight with the stranger or he might be called a coward which would hurt his business. As Valentino was suggesting that they forget all about it and go back to bed, the Baron suddenly embraced him and kissed him, a thing that is likely to happen to anyone in France. Rudolph endured it at the time philosophically, but two days later he was running at the nose and eyes just like the Austrian, who had infected him with a cold. For 10 days the star stayed out of sight with red and swollen nose, mouth and eyes. He says that if he thought the Baron wrecked his vengeance deliberately he would get him back onto the field of honor and flay him alive.